Wee Like Daddy Makes Toilet Training Boys Easy! The BEST solution to teach boys to wee standing just like Daddy. From 12mths+ Wee, flip, flush. Free Toilet Yum Yums come with the Weeman spins around when you hit it with your wee! 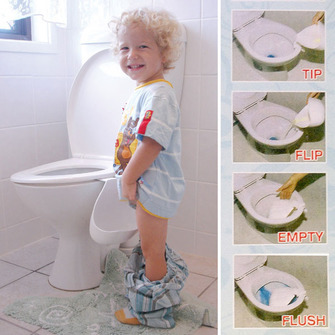 Makes toilet training fun and easy for boys by copying Daddy in real time. Teaches boys to wee standing up. Teaches boys to wee the correct way from the beginning. Can start as soon as your son can stand. 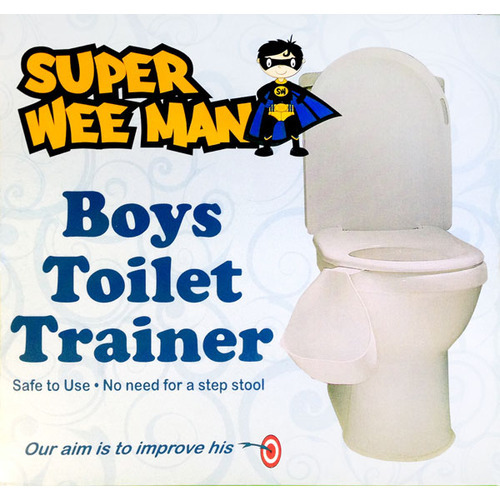 BOYS ARE EASIER THAN GIRLS – The Super Weeman makes boys easier to toilet train than girls. It provides a tangible tool to work with that Daddy can teach and demonstrate in real time. TOILET YUM YUMS SPIN – “Boys and their toys”. This is the magic of combining Toilet Yum Yums with the Weeman. 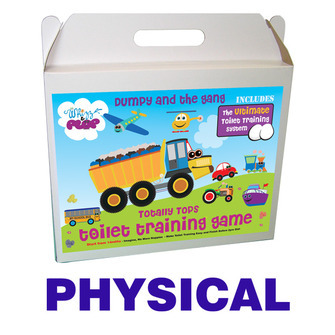 It turns toilet training into a game which boys won’t be able to resist. Hit the Yum Yum in the Weeman with your wee and make it spin….not much more to say really. SPEAK A BOY’S LANGUAGE - Boys are doing/action creatures so they benefit greatly from being shown 'how' from Daddy. 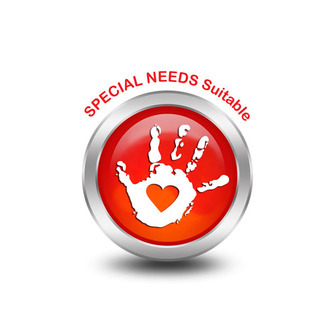 PERFECT FOR SINGLE MUMS – If Daddy isn’t around to teach then you absolutely need a Weeman. Without one it will be very difficult to teach your son how to wee standing without the right tools for the job. 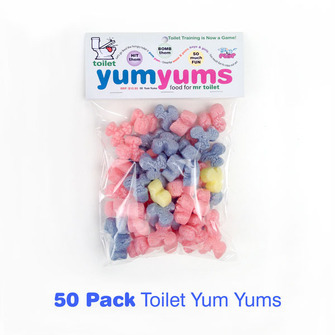 Toilet Yum Yums provide target practice help make it a game and encourage your son to wee the way they were made to. EASIER TO WEE STANDING – Standing to wee is the natural and correct way to go for a boy to go. Teaching them to point down is actually messier and more involved and they end up overshooting. The Weeman makes it easier as all they have to do is stand there – no hands, no stool required. AVOIDS THE MESS - Associated with sitting and overshooting. Sitting and pointing down to wee equals mess on the floor. CREATES INDEPENDENCE – With the Weeman hanging lower on the side of the toilet, they can simply take themselves without you even being there. NO HANDS – The “No Hands” rule is definitely the best way to go when they are younger. They are often not big enough or coordinated enough to use their hands which results in mess – plus a lot of fiddling. 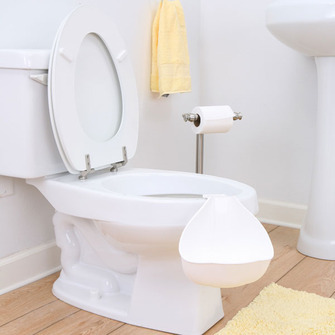 WEE, FLIP, FLUSH – So easy with no clean out required like you would with a potty. The clean water from the cistern washes the Weeman when it is hanging inside the toilet, and with a bit of a shake, you can flip it back over so it is drip-free and ready to go again. TRANSITION TO WEE TARGET - Once we are tall enough to reach. Around 3-4 years depending on their height. Inclusions Weeman Connection Clips x 2 - (One long shaft & One short) to fit the rim of your toilet. Standard Australian fitting is usually the long shaft. FREE TOILET YUM YUMS THAT SPIN AROUND IN THE WEEMAN WHEN HIT - LOADS OF FUN! 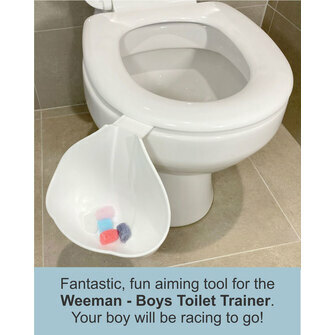 The Weeman is the BEST Little Boys Toilet Trainer for that extra toilet training step - teaching boys to wee standing up. Helps boys be just like Dad! The Weeman allows boys to copy Dad at the same time - monkey see, monkey do! 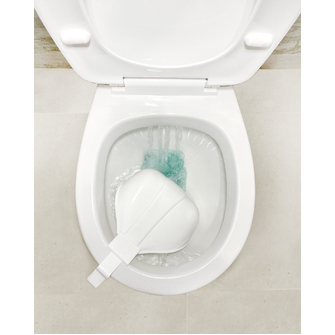 Use the Weeman to create independence - they can wee all by themselves using the Weeman and the great thing is - it is fully flushable. Simply wee, flip, flush! So easy, forget the potty. PLAY THE YUM YUM GAME! 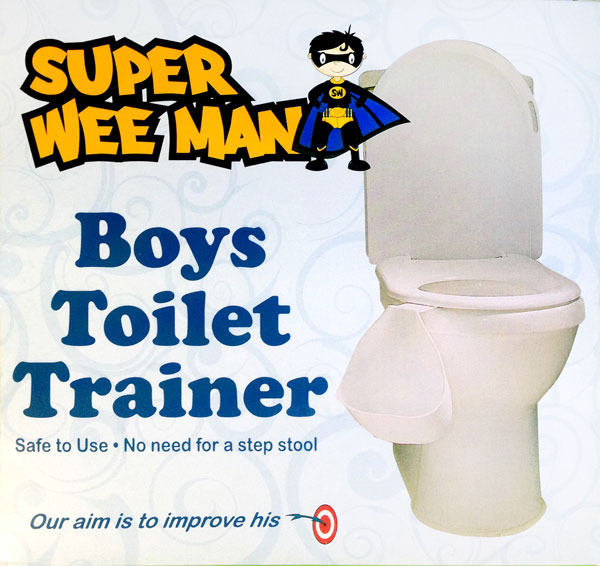 We highly recommend to use the Weeman with our Yum Yums, they make the Weeman simply irresistable to boys, which is why they are easier to toilet train than girls. The Yum Yum spins around when you hit them with your wees.... you try and stop him from going - it is just too much fun! The Yum Yums create also instant feedback making it a fun game without the accuracy needed like it is required with the Wee Target. This is why you need to start with the Weeman, then finish with the Wee Target. The Weeman creates independence - they can take themselves and you don't even need to be there. And, it keeps boys there long enough to go, solving another boy-type challenge. 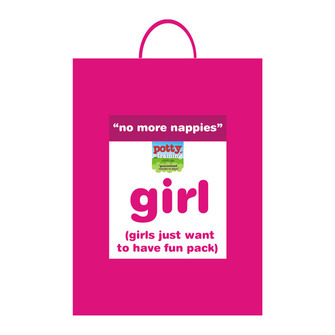 And Mums, if Dad's not around to help, then you really NEED this product. It is your BEST OPTION to teach your boy how to wee standing. You don't have the right tools otherwise. :) Obviously it is a bonus if a family member can demonstrate to teach, but if this is not possible, the Toilet Yum Yums save the day and help create the interest and focus to go. 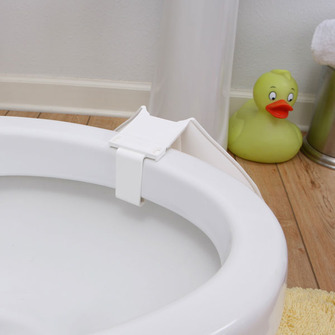 This amazing invention helps little boys use the toilet standing up and improve their aim. The best thing is that no hands are required to use the Weeman. In fact highly recommend they put their hands on the closed toilet seat to balance to keep them occupied. They are often not big enough or coordinated enough to use their hands at that age, so it is great that they can practice "hands free" until such time that they are tall enough and old enough to use the Wee Target where more focussed aiming is then required. The Weeman toilet trainer unobtrusively hangs off the side of any toilet at the height required for little boys to wee standing up. 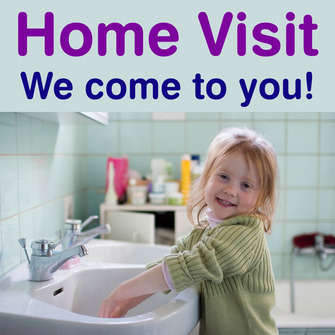 Subsequently, they are able to go to the toilet all by themselves, creating independence and confidence. 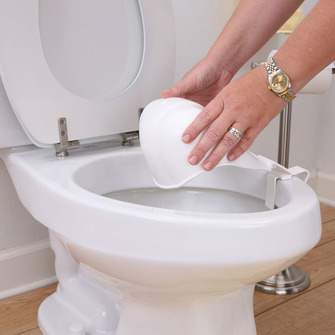 The Weeman comes with two clips to fit the different sized toilet bowls and sits on the side allowing the seat to fold up and down to be used by others. 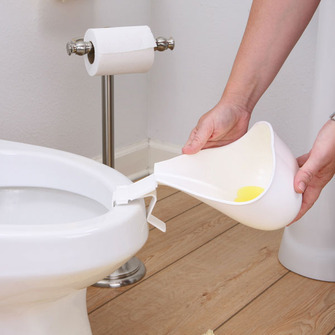 This means it can stay attached to the toilet, ready-to-use, without being in the way for any other member of the household. 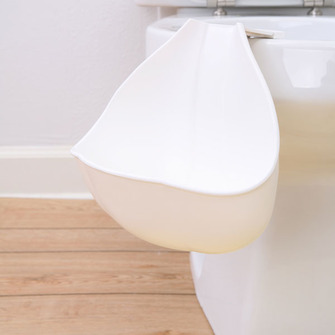 It is completely flushable, easy to clean with a patented no splash or drip design. 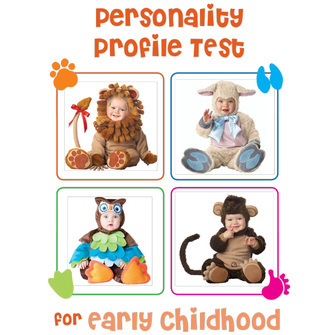 The process is so easy and manageable, a one year old can do it - and we recommend they do! Wee into the Weeman and make the Yum Yum spin. Give it a little shake to get off any excess drips. Lift out ready to use again. 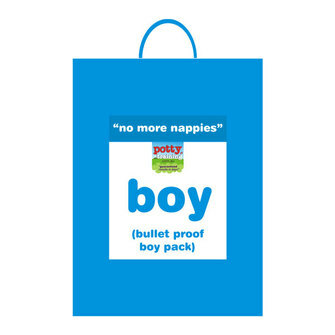 You can use this product as soon as your little boy can stand - around 12-14mths and continue to use it up until about age 3-4years old depending on how tall your boy grows and how quickly. It is purely based on height. Then we recommend you switch to a Wee Target to transition into the toilet. As a general rule we recommend you start with the Weeman and then finish with the Wee Target. Height is the main consideration here. You use the Weeman if your son cannot reach the toilet standing to do a wee. It is like a small urinal that hangs lower on the outside of your toilet pan so your boy can reach without needing to stand on a stool. The approximate age to start using the Weeman is as soon as your boy can stand around 12-14mths to approximately 3-4 years. It all depends on how quickly he grows. A short 3.5 year old may still need the Weeman, whereas a tall 3 year old may not. 2. When should I use the Wee Target? If your boy can already reach the toilet standing to do a wee - without a stool required - then you only need to use the Wee Target. This gets suction-capped inside the toilet and he has to aim at the spot with his wee to make a car, or truck or train. 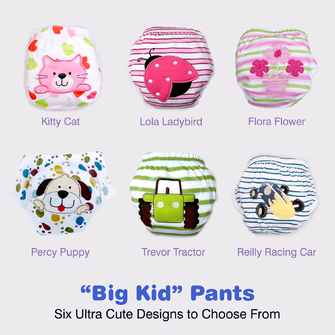 Great for small and tall! 3. Why do I need the Weeman? The Weeman is the perfect tool to help teach your boy the correct way to wee from the beginning - standing. There is more mess to teach them to sit and point down. They overshoot a lot. The Weeman allows your boy to wee standing without using his hands. This is important. They are often not big enough or co-ordinated enough at 1-2yrs old to do this into the toilet. With the Weeman though, it means no hands, no stool required which makes it very easy. Plus, the Weeman encourages boys to go because it is fun to be "big boy" like Daddy. Boys learn far better by doing and copying rather than trying to just tell him what to do. 4. Why do I get a packet of Toilet Yum Yums FREE with my Weeman? The Toilet Yum Yums are just magic with the Weeman. They spin around when you hit them with your wees. Simply a boy's dream come true. 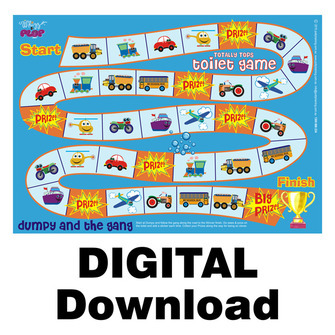 It turns toilet training into a game. He will be racing to go with a simple statement "Quick, let's go feed Mr Toilet the Yum Yum!" and it helps keep your boy there longer to go. 5. Why does the Weeman make boys easier to toilet train than girls? You are able to teach your boy in real time. Daddy demonstrates by weeing in the Weeman (give a man a challenge :)) and then by weeing in the toilet with your son beside you, he can learn in real time. Tell a boy what to do, you are not going to get the same result as showing. They learn quicker this way AND most importantly, they want to be like DAD! Single Mums need the Weeman even more. How else are you going to teach your boy how to wee standing up in preparation for school? You don't have the right bits :). Obviously it is a great benefit if a male family member is able to help out and show your son, but if this is not possible, then use the Toilet Yum Yums to get the job done. The Toilet Yum Yums make the process a game - boys and their toys - so he will be racing to go to make them spin with his wee.